A month after Donald Trump and Congress passed the Tax Cuts and Jobs Act, the public has mixed views of the sweeping tax overhaul and its long-term impact. Just as support in Congress for the legislation was divided along party lines, there are wide partisan gaps among the public in expectations for the law’s personal and national impact. Within both parties, there are sizable differences based on family incomes. The new survey, conducted Jan. 10-15 among 1,503 adults, finds that 29% say the tax law will have a mostly positive effect on them and their families, while nearly as many (27%) say its effect will be mostly negative. A third say the law will not have much of a personal impact. Opinions also are divided about the tax law’s impact on the country as a whole: 35% say the law will have a mostly positive effect on the country, 40% a mostly negative effect and 15% say it will have little effect. The public’s general views of the tax law are similar to expectations for its long-term impact on the country. Overall, 37% of Americans approve of the law, while 46% disapprove; nearly one-in-five (17%) do not offer an opinion. Partisanship is a major factor in opinions about the tax law, but differences between Republicans and Democrats are much wider regarding the law’s impact on the country (and on overall approval) than on its expected personal impact. About half of Republicans and Republican-leaning independents (52%) say the tax law will have a mostly positive effect on them and their families in the years to come. Nearly a third (32%) say that it will not have much of an effect, while 7% say the effect will be mostly negative. Just 13% of Democrats and Democratic leaners expect the tax law to have a mostly positive personal impact, while 35% say it will not have much of an impact; 42% say they will be negatively affected in coming years. A large majority of Republicans (71%) say the law will have a mostly positive impact on the country in coming years. And a sizable but narrower majority of Democrats (63%) say its effects will be mostly negative. Assessments of the law over the coming years vary widely by income as well. People with family incomes of $75,000 or more say the tax law’s personal impact will be more positive than negative. Those with lower incomes have less favorable expectations for the law. Nearly four-in-ten (38%) of those with incomes of at least $100,000 say the law will have a mostly positive personal impact, while just 20% expect negative effects (35% say it will not have much effect). Among those with incomes of $75,000-$99,999, 44% say the law’s personal impact will be mostly positive compared with 19% who say it will be mostly negative; 30% expect not much of an effect. Among those with lower incomes – less than $75,000 – only about a quarter say the law will have mostly positive effects for them and their families. And about as many (or more in the case of those with incomes below $40,000) expect mostly negative personal effects. Income differences are more modest in views of the effect of the tax bill on the country as a whole. Among Republicans, in particular, there are sizable income differences in expectations for the law’s personal impact. A majority (62%) of Republicans and Republican leaners with incomes of $75,000 or more say the tax law will have a mostly positive impact on them and their families. That compares with 50% of Republicans with incomes between $40,000 and $74,999 and 43% of those with incomes below $40,000. Majorities of Republicans across income categories say the law will have a mostly positive impact on the country in coming years. Among Democrats and Democratic leaners, those with lower family incomes (less than $75,000) are more likely than those with higher incomes to say the law will have mostly negative effects personally. And while majorities of Democrats across income categories say the law will negatively impact the country, this view is more pronounced among those with incomes of $75,000 or more (74% say this) than those with lower incomes (59% of less than $75,000). Most Americans say they feel they understand how the tax law might affect them and their families at least somewhat well: About two-thirds (65%) say this, though just 30% say they understand the law’s impact “very” well. Fewer feel they understand the law “not too well” (18%) or “not at all well” (13%). Overall, personal understanding of the tax law’s impact varies only modestly across demographic groups. However, those with more education feel they understand how the law might affect them better than those with less education. Partisan differences in understanding are modest: Republicans and Republican leaners (71%) are only somewhat more likely than Democrats and Democratic leaners (65%) to say they understand very or somewhat well how the law might affect them. 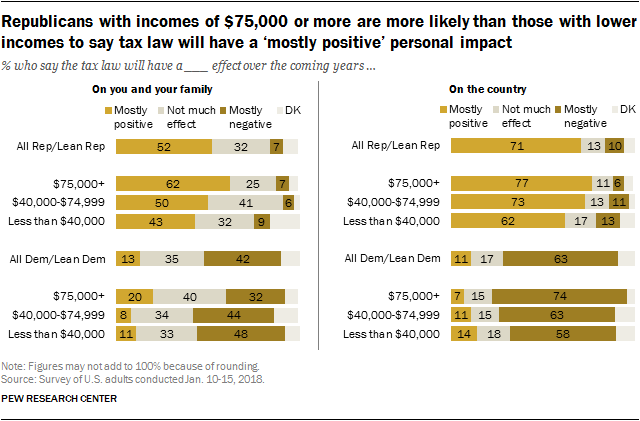 Among the majority of the public who say they understand at least somewhat well how the tax law might affect them, expectations of the law’s personal impact are more positive than negative: 37% say it will have a mostly positive effect over the coming years on them and their families while 28% say it will have a mostly negative effect; 32% say it won’t have much effect. Among those who feel less confident in their understanding of the law, 39% say it will not have much an effect on them personally; 27% say its effect will be mostly negative, while 15% say it will be mostly positive. Republicans who feel they understand how the law might affect them and their families at least somewhat well are far more likely than other Republicans to say it will have a positive impact on them, and on the country as a whole. Among Democrats, the balance of opinion about the personal impact of the tax law differs little between those who say they understand the law at least somewhat well and those who do not. But Democrats who say they understand the law are more negative about its impact on the country than those who say they do not have a good understanding of the law. Across most demographic groups, overall assessments of the tax law tilt more negative than positive. Still, there are significant differences in approval by race, age, education and partisanship. Nearly four-in-ten Americans (37%) say they approve of the tax law passed by Trump and Congress, while 46% disapprove; 17% do not offer an opinion of the legislation. While whites are somewhat more likely to approve than disapprove (45% vs. 39%), blacks (66%) and Hispanics (58%) widely disapprove. Young adults are far more likely than those older to disapprove of the tax law: 54% of those under 30 say they disapprove, compared with 39% of those 65 and older. And while those with at least a four-year college degree disapprove by roughly two-to-one margins, those with less education are roughly divided over the tax law. Nearly two-in-ten of those with less education, however, do not offer an opinion on the tax law. Fully three-quarters of Republicans and Republican leaners say they approve of the tax law, including 57% who approve strongly. Opinion is nearly the reverse among Democrats: 73% of Democrats and Democratic leaners say they disapprove, including 58% who disapprove strongly.